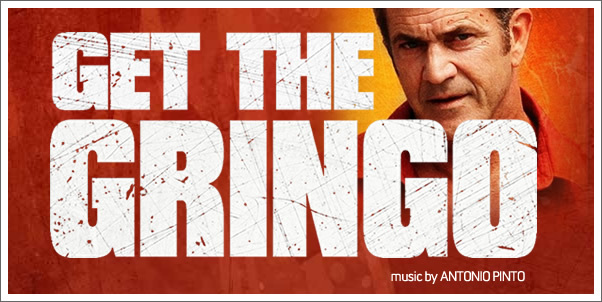 Based on the UK title of HOW I SPEND MY SUMMER VACATION, one might be forgiven for initially thinking GET THE GRINGO is the latest sun-soaked romantic comedy – but the “gringo” in question, played by Mel Gibson, is spending his summer vacation in a Mexican prison, which would make an unusual location indeed for such a film. Rather, this is a gritty thriller in which the main character’s only name (other than “gringo”) is “Driver”…pretty reminiscent of last year’s extremely well-received gritty thriller, no? Gibson’s character finds an unlikely ally in a 10-year-old boy, who teaches him the ropes and in turn needs to be saved from a crime boss who is after his liver (due to them sharing a rare blood type). The flick got a theatrical release in a few countries, but in the USA, it went straight to video-on-demand; not exactly a stunning comeback for Gibson and his damaged public image, though his performance is by all reports decent here. The score is provided by ANTONIO PINTO, a relatively unknown composer, but one with some experience with similarly gritty films such as LORD OF WAR (likely the highest-profile entry in his filmography). Here, as there, PINTO takes a relatively low-key approach to his score, providing a mostly themeless thriller ambience spiced with Latin accents that play to the film’s setting. Described like that, it doesn’t sound like anything special – and it isn’t, really. But the brief score of less than half an hour in length makes for a surprisingly pleasant background listen. In a way, it’s like a combination of Antonio Pinto, but far more accessible than either of those composers’ scores tend to be.